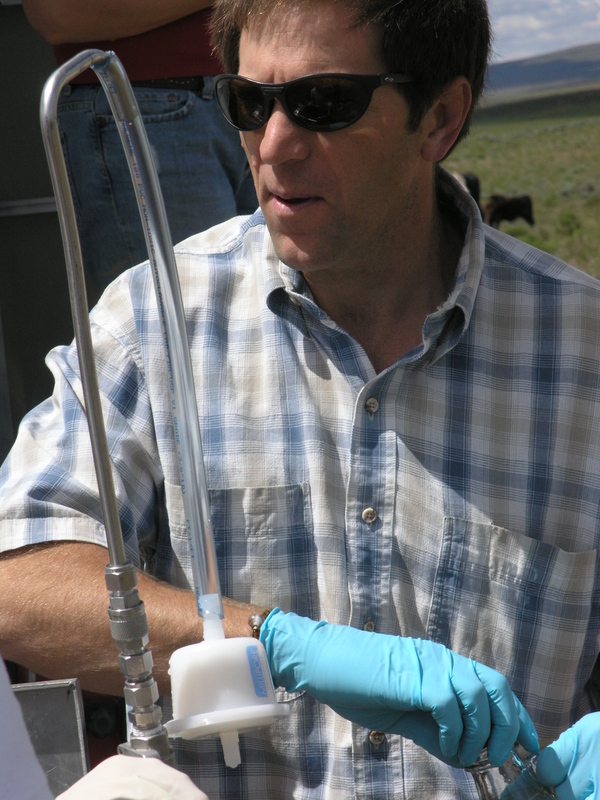 I sample ground water for contaminants, assess the impacts, and communicate what I learn to adults and students. I’m the regional Drinking Water Source Protection Coordinator. What are some of the classes you took in college to educate yourself about this career? I have a Geology BS and a Hydrogeology MS de gree. Both degrees required math through calculus, along with chemistry and physics. Most of my geology classes included field trips where we spent time learning how to relate what we discussed in class with “the real world.” Speech and writing classes were also very helpful. Since completing my degrees, I’ve taken classes in GIS, databases, statistics, more chemistry, and how to communicate more effectively. . After I had sufficient years of work experience, I took the tests to complete my Professional Geologist certification. What made you decide that you wanted to pursue this career? I’ve always been fascinated by rocks, minerals, and mountains. I enjoyed fishing, hunting, and horseback riding with my dad and seeing the twisted and folded rocks of the Lost River Range and the Tetons, the amazing lava rocks of the Snake River Plain, and the Yellowstone Plateau. I had several influential professors that piqued my interest in how the geology came to be in the Eastern Idaho River Plain, and I had the opportunity to study how ground water travels. A few years into my career, I started doing classroom presentations, mostly about the Eastern Snake River Plain Aquifer. I’ve found that what I enjoy most is trying to understand how our aquifer works and how contaminants can impact it, sharing what I’ve learned with others. What does your typical day entail? Most days I begin by responding to emails. I usually have several projects I’m working on, such as planning for an upcoming education or outreach event where I need to coordinate with others, writing a document or display to communicate some aspect of the event or preparing a presentation then In between deadlines, I usually have a water quality sampling project I’m planning, collecting samples, or writing a report for. I usually have a meeting or conference call most weeks. I might also go to an evening public meeting or city council meeting during the week. Most evenings I’m done with work by 5 pm, others, I might work later to complete projects. The two most important forces controlling groundwater movement in rock are gravity and the attraction of water molecules to itself and other substances. Gravity causes water to infiltrate through the ground. Gravity generates the flow of springs, rivers, and wells. If the pores in rocks and sediments are connected, gravity allows the water to move slowly through them. The attraction between water and soil or rock particles is called adhesion. 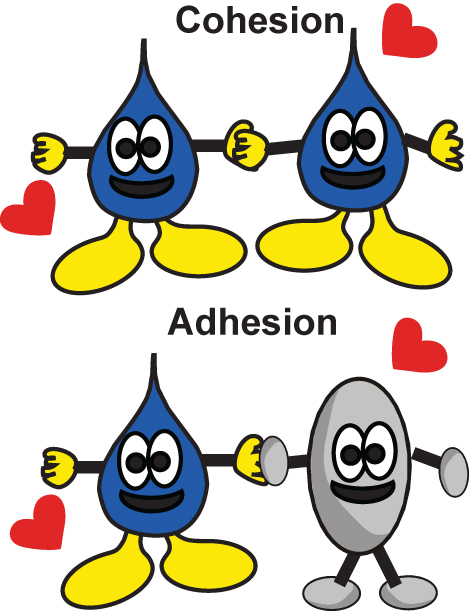 Adhesion is the attraction of water to other substances. It is adhesion that helps hold water in soil for plants. If gravity were the only force involved, all water would drain downward through the soil. The attraction of water molecules for each other is called cohesion. You can see cohesion at work when you dip a pencil into water and then pull it out. A drop will stick to the bottom of the pencil, seemingly held there by the water above it. Water will also rise in a small tube if it is immersed. This phenomenon is called capillary action. 1. Cut off an inch or so off the bottom of the celery stalk. 2. Place the celery in a glass of water colored with food coloring. 3. Watch for the movement of the color to the top leaves of the celery. This may take a few days. The colored water is “drawn” upward, against the pull of gravity. This effect happens because, in plants, water molecules move through narrow tubes that are called capillaries (or xylem). April 9, 2013 in Questions.